The notion of "leftover space" has always been of great interest to architects, but in the context of global urbanization it conjures a particularly visceral response. Leftover space””in the sense of being ghettoized and depicting a sort of bare essentiality of being in architecture””is not always easy to look at much less understand, especially for a profession whose responsibility is designing the structures that people will inhabit. For the most part, the issue of global poverty is translated through viral images of shanties infecting the landscape, peripheral slums leaching off the urban core, and pictures that instill fear of an assailant rise of diseased squatter cities. This not only demonizes the third world, it painfully reminds us of our own failures to address the infrastructural necessities of millions. However, these images narrate only part of the story for those who go on sifting through the remains of an urban evolution which has long since abandoned them. Wes Janz , an architect teaching at Ball State University in Indiana, wants to show how these scavenged places are also claimed by incredible human spirit. His forthcoming book, One Small Project , is a powerful portrait of the millions of people who have used their own architectural ingenuity and unrelenting pride to construct for themselves a place to call home, despite some of the worst living conditions on the planet today. I spoke with Wes about his work as an architect and an educator, his book project, and what we have to learn from these informal pioneers of global urbanism. Wes, what is the driving force behind your upcoming book? In the past five years, I visited Bangkok, Berlin, Buenos Aires, Chicago, Colombo, Delhi, Hong Kong, Istanbul, Los Angeles, Mumbai, New Orleans, St. Petersburg, and Singapore. Others. One billion leftover people””typically called squatters or self-builders””claim leftover spaces in cities and live in unauthorized dwellings made of scavenged, leftover materials. When today's students are my age (52), there will be two billion squatters worldwide, or one in four people. 1 in 4. In my hometown of Indianapolis, it is estimated that there are 2,100 homeless people on any given night and only 750 beds in homeless shelters. And there are nearly 8,000 abandoned houses. I would have guessed 80, or maybe 800. 2,100 homeless people and 8,000 abandoned houses in Indianapolis?! With the onesmallproject website and book, I'm intending to bring forward a number of persons doing interesting work in such settings. We need role models to help us believe that each of us can make a small difference in the life of one other person. In this, I'm also intending to get others involved, especially designers and students. We have lots to learn and contributions to make. How did you settle on the concept for it? I don't think we can “solve” this “problem.” It's too complex, too outside our frames of reference. Approaches that promote systems thinking or building technologies, while comfortable and known, miss the point: What about the people? Can they be involved? Can they be relevant? The leftover is a potent category; synonyms include waste, debris, rubbish, as well as surviving, unconsumed, and outstanding. Someone or something typically seen as worthless can be understood simultaneously to be worthwhile. I like this shifted perspective. Is a “slum” a place of poverty and pain, as well as a place of vibrancy and life? What will the self-builder teach me, an architect? Am I the homeless one? Have I lost my way? Now, I'm working bottom-up, one person and one small project at a time, taking seriously the displaced family, the claimed space, the scavenged brick. It's the cascading energies of small responses and helping moments that interest me. An informal settlement in Istanbul, Turkey. 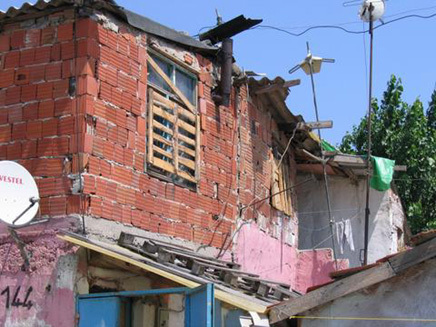 Known as gecekondu because they are “built at night,” this squatter housing takes advantage of an ancient law that says if construction begins after sundown, whatever is standing at sunrise has legal status. According to Robert Neuwirth, half the residents of Istanbul””perhaps six million people””live in gecekondus, photo by Amal Cavender (2005). Perhaps a time when architects stand to make the greatest contribution to relief architecture is during the course of their education, through activist forms of school curriculums and studios oriented towards working with needy communities directly, that can help challenge and define both students' and educators' notions of 'architecture as a form of community service.' Where do you see architects today making the biggest impact in this regard, and how might the educational process be having a profound effect on the current evolution of the profession? More voices now see a building as a way to address, not answer, the needs of the billions who fall outside the scope of conventional practices. At Minnesota , Tom Fisher and Virajita Singh teach a seminar titled “Waste Not” which considers the recycling of ordinary waste; in addition, Tom consistently challenges architects to get involved in the lives of homeless and disadvantaged populations. Hector LaSala and Geoff Gjertson , at Louisiana-Lafayette , founded the Building Institute; among their great projects is the spontaneous and continuous creation of the Acadiana Outreach Center in Lafayette. D.K. Ruth is director of the Design-Build graduate program at Auburn University; most recently a team of his students reused a shipping container to create a new house for Barbra Meyer, a 67-year-old woman who lost her home in Hurricane Katrina. As options are established for and created by young practitioners, more will find their futures in alternatives to conventional practices. This is a very good thing. Even as the AIA , USGBC , NCARB , and NAAB institutionalize their (dominating) roles, we must continue to find our own voice and create space for others to find their voices as well. Still, practitioners and professors are creatures of habit. Too often, students in community outreach activities are set up as young architect-heroes presenting buildings to grateful, often tearful, recipients. These are the same old power relations and ego trips masked as new practices. I'm not convinced. A squatter's house in Berlin, photo by Fabian Thode (2001). Who are the main voices contributing to the architectural dialogue around a “squatter urbanism”? Robert Neuwirth 's Shadow Cities sets out his insights from living in slums in Nairobi, Rio de Janeiro, Istanbul, and Mumbai, each for at least six months. Here: the one billion squatters in the world “mix more concrete than any developer. They lay more brick than any government. They have created a huge hidden economy””an unofficial system of squatter landlords and squatter tenants, squatter merchants and squatter consumers, squatter builders and squatter laborers, squatter brokers and squatter investors, squatter teachers and squatter schoolkids, squatter beggars and squatter millionaires. Squatters are the largest builders of housing in the world””and they are creating the cities of tomorrow.” That insight changed my thinking about where the action is and the world I want to be a part of. Howard Davis , in The Culture of Building , describes the ways in which an informal settlement in Pune, India is organized to build. Baraka , a film by Ron Fricke captures both the harmony and dissonance that humans and nature have brought to the planet. Mike Davis's new book Planet of Slums is sure to add to our understandings. Other architects are involved, directly. Marjetica Potrč installed a waterless toilet in a slum in Caracas, Venezuela. Sheila Kennedy, as part of her Portable Light project, brought light to a village in Mexico. Manual Practico de Construccion: Para Obras Nuevas Y Arreglos by Jaime Nisnovich is a how-to book for self-builders in Buenos Aires. Specific to the U.S. condition, Barbara Ehrenreich, author of Nickel and Dimed: On (Not) Getting By in America , says that the minimum wage workers are the nation's true philanthropists. It is on their backs that our privileged lifestyles are built. In The Working Poor: Invisible in America , David Shipler says of mistreated migrant workers in North Carolina: “You can hardly go through a day, much less observe a holiday, without the fruit of their labor in your life.” Ted Botha's Mongo: Adventures in Trash profiles ten scavenger types in New York. Thoughtless acts? by Jane Fulton Suri + IDEO considers how we intuitively adapt, exploit, and react within our immediate environment. 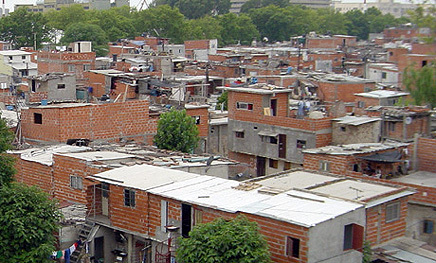 Known as Villa Miseria, this squatter settlement in Buenos Aires is a city within a city (2006). If squatter settlements represent a backlash to the reckless policies that have driven the growth of global urbanism (where squatters have been virtually stripped of their political belonging to the world), then what sorts of models or unique architectural collaborations can be explored to help them reconnect politically? In a world where 200,000 people move to cities every day, we need a lot of houses. Even the bare beginnings of a shelter””four columns and a roof, a masonry wall, or a modified park bench””are a start, as are ALL the houses in squatter settlements and slums. Again, with 70 million people urbanizing every year, floors, walls, and roofs are needed. Lots of them. Lots. The existence of one billion squatters might suggest that ownership is overrated. That “owning” property in a legalistic sense is not such a big deal. 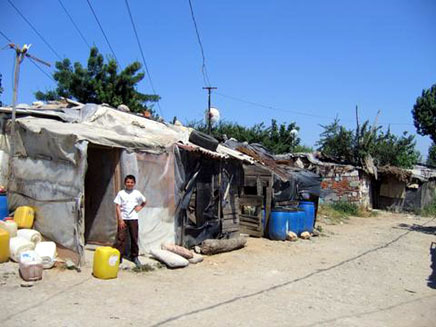 People in the slums have housing and most find work. They have relations with neighbors. They make their way in the world. Why can't we start there? This is Savita and her son Manu. They live in Surat, India, a place that floods every year. Savita's husband is a cart puller who works for daily wages in the nearby area. 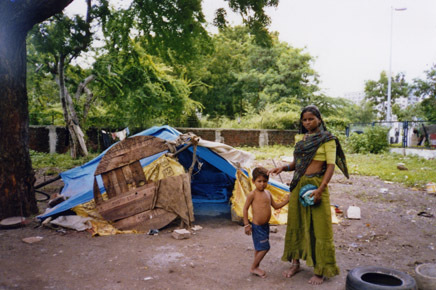 Many people move from their slum dwellings away from the river and construct temporary dwellings throughout the city alongside foot paths, inside railway stations, and in city parks. This is what it means to live on an annual flood plain. Savita's younger son is asleep inside their structure. Photo by Anindita Chaudhary (2005). 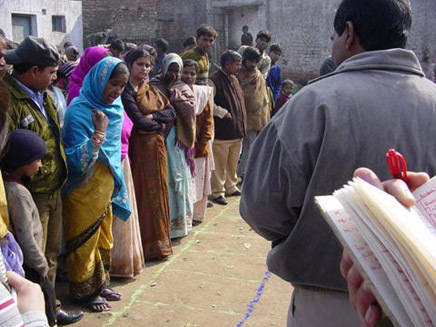 Renu Khosla and her associates register an official presence for slum dwellers in Delhi. A trained community leader draws two parallel rows of squares on a sidewalk, using chalk. These represent houses on the street. A passer-by asks: What are you drawing? The passer-by is asked: Do you live in one of the houses? A crowd gathers. More questions. Is there a father in your house? A mother? Children? For each “yes” a physical marker is placed in the appropriate chalk square. A father, a pebble. A mother, a twig. A child, a leaf. Later, findings are entered into the city's GIS data base . Through the piling of pebbles, twigs, and leaves the people exist, officially. They are. Dr. Khosla has over 25 years of experience in the area of urban poverty, poverty alleviation, education, community mobilization and social capital building, and gender issues. She has been responsible for implementation of citywide slum upgrading projects in Delhi, among many other accomplishments. Photo by Nihal Perera (2003). Santiago Cirugeda Parejo of Seville, Spain works within the legal system, exploiting gaps in administrative structures, gaps in a governmental body's supervision of city streets, gaps in official procedures that allow his constructions to look “official” even as he enacts certain forms of civil disobedience, gaps in what it means to look “legitimate” in places where the law fails so he can exist legally in a loophole. Among his more notable efforts: denied permission to build a playground, he was granted a dumpster permit and then built a playground that looked like a dumpster; spray-painting graffiti and then living in official-looking scaffolding while removing the same graffiti; and erecting and occupying a rooftop crane that others think is there only to move building materials up and down. Cengiz Bektas , an Aga Khan award-winning architect in Istanbul, engages in community work without causing gentrification to occur. The main project of Bektas and his associates was in Kuzguncuk, one of Istanbul's oldest neighborhoods with between 5,000 and 10,000 residents from at least four different ethnicities. In the midst of sculpture workshops, choir singing, wall painting, and flower planting, the architect opened his house, then under repair, for everyone who needed guidance in order to repair their chimney or fix a leaking roof. Advice was offered at no charge to show people that with some effort they could have the house they wanted without leaving their neighborhood. Bob Beckley directs the Genesee Institute in Flint, Michigan. General Motors was formed in Flint and the drip-drip-drip of the imploding U.S. auto industry places Flint on the cutting edge of the rust belt's collapse. Under his leadership, in 2005 the Genesee County Land Bank cleaned and mowed 3,301 properties and removed 135 tons of trash from 78 lots; and 248 side lots were transferred to adjacent homeowners for the sum of $1 each. These are small gestures: mowing lawns, cleaning yards, selling side lots for $1. Each of these persons, while part of larger organizations and systems, start with the small project””the twig, the playground, the open door, the $1 sale””created on behalf of one other person. Makeshift housing in and around Istanbul, Turkey. Photo by Amal Cavender (2005). What can architects learn from squatter communities themselves? I like the way you set this up: to “learn from” which goes beyond “learn about.” To learn from the squatters is honest about where knowledge resides””with them and with us. I like this. We can learn from the squatters as much as we want: sustainable design principles, materiality, planning, and more. Too often our learning as architects is framed as “learning to build.” That is, we acquire established knowledge regarding construction, materials, details, contracts, and the like. Nihal Perera created the CapAsia field study program in 1999; in 2001, I joined as co-director. Nihal takes students to south Asia for eleven weeks every other spring semester including a six- to seven-week immersive experience in one city: 1999 Kathmandu; 2001 Mumbai; 2003 Delhi; and Ahmedabad in 2005. I coordinate a two- to three-week design-build component. Nihal and I speak of “building to learn ” as a way to invert and expand the established paradigm. Working in a squatter community in a different country, in a world with its own perspectives regarding the environment, locally available materials, recycling, and, one must say, the formal economy, gives new perspectives regarding our profession. As important, if not more so, “building to learn” refers to learning about one's self in relation to the “other,” rethinking one's place in the world, and questioning, fundamentally, how one chooses to engage the world and its people first as a fellow human being, then as architect, planner, or designer. 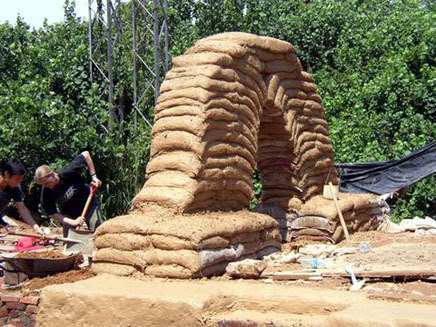 Chamnarn Tirapas and Dorothee Dettbarn work on a Mud Pavilion in Kadubedda, Sri Lanka, as part of Ball State's CapAsia III field study program (2003). So many architects just want to have and provide a solution. Do you agree, that a lot of how we will respond effectively to crisis in the world in the future, depends on our ability to recognize and assist (through our participation) what is already being improvised successfully by the sheer inventive human spirit of communities that survive in the face of great need or neglect? As opposed to offering our services from a top down approach? In Sri Lanka immediately following the tsunami, the first responders made a huge difference. They swept into the country ASAP to build temporary housing, drop thousands of tents along the ocean highway, coordinate infrastructure reconstruction, etc. Top-down has a place. Four months later, when we arrived in March 2005, it was obvious that people were making their way. Living in a tent, cooking their meals (maybe on open fires), with children going to school. When I returned in August most of the tents were gone, new permanent houses were being occupied, some fishing was happening. Bottom-up was thriving. I think you're right when discussing “the sheer inventive human spirit of communities that survive in the face of great need or neglect.” I don't want to romanticize this characteristic or be sentimental about the difficult lives lived in a slum or following a disaster. Still, there is something present in the slums, a resourcefulness, a sense of engagement, an immediacy that is different from what many of us know and live in the West. The absence of this sensibility was striking in driving through southern Mississippi with Olon Dotson , post-Katrina. I'm sure this will upset some people and I'm sure I don't have anything close to the full story. But still, I was struck by how little had been done . . . four months after the hurricane and the storm surge, almost nothing was happening on the ground. I saw hundreds of sites in southern Mississippi where houses had been flattened. Throughout this landscape are sprinkled white FEMA trailers, grains of salt in this great open wound. These are wired and plumbed, but the landscape remains completely disheveled. I did not see one place where a land/house owner had piled bricks, or sorted out wood framing members, or stacked exterior siding, or raked up debris, or any such engagement. Not one. When I look at my own life, I see similarities. I model creativity and I'm a creative guy. Yet, I've lost the need to create in order to survive and with that I've lost a kind of energy, intensity, and relevance. It's very heavy, all this sameness. Bay St. Louis, Mississippi four months after Hurricane Katrina (2005). Does the compound nature of suturing the disaster landscape (that is, if it cannot be solved by architecture alone) force architecture to evolve into an even more open-source type of practice, that encourages further integrations with other fields? In this context, can architecture better serve the shelter-needy, not just with shelter prototypes, but as a greater conduit””or hub””to help assemble various other needed forms of participation, which together can yield more comprehensive solutions? Can architects become instigators of greater disaster-response collaboration? The Sri Lankan architect Madhura Prematilleke knew the Kalametiya villagers pre-tsunami and there's no question he was and is a model instigator working with the villagers, the Green Movement of Sri Lanka, Sonali Sellamuttu Senaratna and Dinesh Sellamuttu of the Kalametiya Rehabilitation & Development Trust, Service Civil International , the Sahana Project , local organizers Becky Johnson and her husband Saman, and others. Nihal Perera, Tim Gray and I, along with our 21 CapAsia students, saw our role in Kalametiya as “catalysts” working within the processes of the locals. We spent several days first cleaning debris from the nearby lagoon, setting up a play area for the children, playing volleyball with the villagers, and sitting in their temporary houses. This settled us within their daily rhythms. The fact is we intended to start and complete a demonstration house at Kalametiya, one that would guide the construction of the other 29 houses. But we had to let go of this intention. We were fighting to “instigate” but found another sort of response was needed. Too often, this is the problem: architects being instigators. I'm less and less interested in affecting someone else's life, in being an agent of change. More and more, I'm interested in being changed and in preparing myself to be an effective respondent. How do we develop and balance future housing relief models with flexibility, mobility and impermanence (in order to respond to the immediacy of crisis and disaster displacement), with the need for longer range architectural solutions that will also ground and help stabilize these displaced, providing them the necessary security they need to go on? I like Margaret Crawford's article “Can Architects be Socially Responsible?” (in Diane Ghirardo's 1999 book Out of Site ). Crawford answers her own question: “as the profession is presently constituted, no.” Practice is too compromised and uninterested in taking action. She does offer two approaches: one focuses on “existing material conditions rather than on idealistic projections of future technical capabilities”; the other seeks “compelling stories about social needs” such as the homeless; individuals excluded from the real estate market; communities threatened by decay or development; and elderly, poor, and minority groups with inadequate housing. Crawford argues on behalf of existing materiality and biography. I think future housing relief models should begin with specific situations on the ground and understandings about specific persons placed in the immediacy of crisis and disaster displacement. Start with a person and a material that is immediately available. Let the architecture flow out of those concerns. 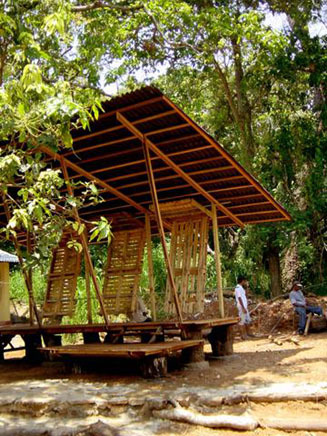 A Wood Pavilion in Kadubedda, Sri Lanka built primarily of materials scavenged within walking distance of the site by students from Ball State's CapAsia III field study program and the University of Moratuwa (2003). On that same tip, does responding to disaster turn the architectural product into something more experimental, blending in areas of artistic reflection, financial reorganization, community participation, and, can relief architecture help guide efforts towards more critical policy debates, rather than just providing a shelter product? How can architecture help coordinate an overall strategy of disaster relief experimentalism? Does the medium of architecture become suitable this way to then be able to take on the multitude of globalized conditions and varied factors that together make up a multilayered typology of urban crisis? I'm curious about how the process of disaster relief works . . . how the process, material, and medium become one. "Timber Pallet Workshop": I-Beam Design in collaboration with Department of Architecture at Ball State University, Muncie, Indiana, U.S. (2004). In 1999, Suzan Wines and Azin Valy of I-Beam Design received an award for their Timber Pallet House Prototype designed in response to an Architecture for Humanity competition. Their observation that relief is shipped into disaster settings on pallets led to the question: can pallets be used to initiate transitional houses in Kosovo? 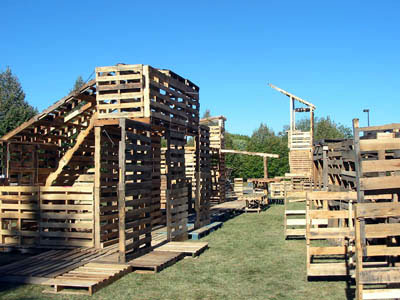 In 2004 Suzan and Azin came to Ball State to lead a four-day Timber Pallet Workshop with me: 30 students and four faculty colleagues designed and constructed a “village” of six structures, using only (500) pallets and hand tools. When I went to Sri Lanka six months later, I was looking for timber pallets. And I didn't see any. Zero pallets. In this case, there was no connection between what I knew about a war zone in Europe and what is possible following an Indian Ocean tsunami. I've seen several disaster settings. Each was, and remains, different from the others. Jaffna, Sri Lanka in 2003 after months of sustained shelling and bombing by government forces; not even squatters had moved back. Post-tsunami Sri Lanka twice in 2005; 30-foot walls of water crushed hundreds of miles of shoreline without warning. New Orleans, post-Katrina; houses sitting in toxic gumbo for several weeks in near 100 degree temperatures and 100 percent humidity. 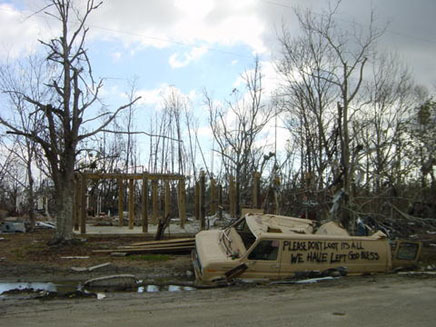 Southern Mississippi post-Katrina; sustained 160+ mile per hour winds and a 35-foot storm surge. I haven't experienced two more recent disasters: the Kashmir earthquake (3.3 million homeless, in winter, many inaccessible in the mountains) and 1,000 dead in a Philippines mudslide. Each of these disasters was and their aftermaths are unique. I don't know, right now, how to “take on the multitude of globalized conditions and varied factors.” But it's a good question. Instead of creating from a distance, I'm interested in getting involved over longer periods of time, in particular events, moments, and lives. I want to be engaged longer term, in Kalametiya, Sri Lanka, and in Buenos Aires, Argentina where I work with my colleague Ana de Brea . This will be framed as relationships among me and local persons, processes, and sensibilities. I want to build trust, not experiments. How does the work you engage with your students reflect the book's intentions, and are there any projects which stand out that are experimenting with different ways of tackling world squalor? A number of students provided important energy. Kurt West is the webmaster for onesmallproject.com and assistant editor for the book. His undergraduate thesis tracked his relationship with a long-abandoned house on Muncie's eastside. And I collaborate with three alums””Jerome Daksiewicz, Adam Janusz , and Devin McConkey””in 26262625 . In 2001, the Arbor was our first attempt to build a beautiful small building with no money, no power tools, using materials scavenged in my neighborhood. "Arbor" by 26262625, a collection of architects that examine and challenge society's fascination with capitalism and consumerism, in Indianapolis, Indiana, U.S. (2001+). My third year studio just completed designs for a Village Center in Kalametiya. Madhura helped introduce the project and reviewed designs via ftp site and teleconference. Hopefully we made a good contribution to the village, its people, and the final design. There is very good energy for such topics among our post-professional Master of Architecture students. Many come from south Asia (India, Nepal, and Sri Lanka) and others are citizens of Argentina, China, Colombia, Denmark, Germany, Indonesia, Mexico, Thailand, Turkey, and the U.S. They engage our “global citizen-architect” mission and know there is both need and knowledge in their home countries. Brad McKinney hides his squattio””a squatted studio work space””within the deep concrete beams of a four-lane bridge over the White River. The platform and desk, when lowered onto the raised bank, provide a broad panorama of the river, in a place few people visit. Amal Cavender will provide one of the first critical analyses of self-builders' work, using the historic Syrian city of Ma'aloula as her case study. It's possible that Jody Phillips , while enrolled in our graduate program, has built more timber pallet structures than anyone in the U.S. TÃ¼lay GÃ¼nes argues that scholars overly romanticize temporary dwellings; by visiting the West Bank and Gaza in 2004, she gained insight into the political weight that caravans have for the Israeli government when claiming territory. Bhavana Mokha is setting out a taxonomy of temporary architectures. 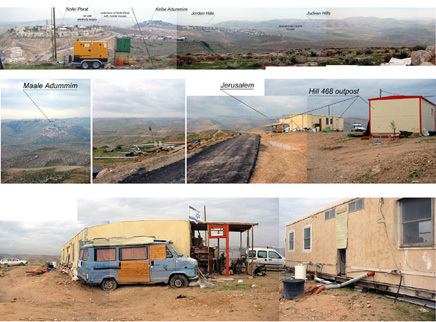 An ad-hoc portable housing unit, as documented in "Mobile Houses in Context: Israel West Bank Settlements" by TÃ¼lay GÃ¼nes, featured in Polar Inertia (2005). What is the hypothesis, or the rationale behind the 'scrap compiler'? How is it expected to have actual application to those residing in the slums, or is it seen more as an exploration of technology and those tools for assisting in translating data? What is the ultimate aim of this project? Nutt worked on-site at Bangkok's international airport, which is undergoing a significant expansion, and noticed that good building material was being thrown away as a routine part of the construction process. And he asked a good question: in a city where many people live in informal settlements, should architects be so casual about the disposal of leftover materials? We're very interested in his project's potential. I say “we” and want to include my colleagues Kevin Klinger and Branko Kolarevic . Both are former presidents of ACADIA (Association for Computer-Aided Design in Architecture) and are leading thinkers in the digital media and fabrication areas. We co-taught vertical studios last semester and explored the overlaps of no- and high-technology. With good reason. I know some of the children of Kalametiya; they're good candidates for the $100 laptop computer being developed by Nicholas Negroponte and One Laptop per Child. I'm also wondering if personal fabricators, as discussed by Neil Gershenfeld in FAB , have a role in squatter settlements around Buenos Aires. We shouldn't turn away from such opportunities. A number of our students and a few of our faculty are in the early stages of building a body of knowledge regarding squatter urbanism and architecture. Like students before him, Nutt provides a role model and gives us just a little more confidence that we can find relevance in the lives of the self-builders and squatters. His thesis takes us another small step down one path in our questioning. 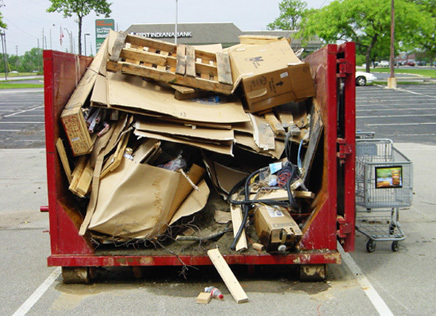 "The construction dumpster is a unique and universal urban form, visible in nearly every western city. It is a utilitarian form dictated by a need for mobility from the construction site to waste plant, and it is a collector of urban debris, a sort of cabinet of wonder of what society deems expendable. " - Dumpsters , by Ted Kane (2005). I'd like to thank Wes not only for taking the time, but for pointing out so many great resources. There is no doubt an endless supply of "un-knowledge" out there when it comes to this topic, meaning there is both so much still to learn as well as to perhaps un-know while confronting the urban catastrophes of so-called globalization . It's certainly going to take a whole new level of commitment from architects like Wes, among others, who are willing to engage communities directly, and build to learn. But, at the rate it's going now, eventually all major cities will be shaped more dramatically by a squatter urbanism and the spatial politics therein. And so, perhaps, some of the greatest future architects will be born out of the favelas themselves, or soon be teaching brilliant studios to a fortunate group of students in the slums. Indeed, some already do. However, maybe, the next generation of master engineers is the one housing close to 2 billion people in impromptu squatter cities today, cultivating evolutionary housing models on their own, and improvising greener, more nimble infrastructures out of trash. They are the ones writing the construction manuals of the future. Could it be their ecology that will not only serve as a resourceful model for various disaster contexts, but help to envision a more conscientious post-urban metropolis of recycled cities brimming through out the next century? Who knows, if their ingenuity is any indication, one day, a squatter urbanism may even lead to a truly bottom-up re-structuring of a more balanced and responsible world economy. Interview by Bryan Finoki (2006). Images: Wes Janz (unless otherwise specified) (2006). and now it's officially licensed under a master readership, too. Wow, I didn't know about that law of building after sundown in Turkey. Can you imagine if that law was honored in our cities? Bryan - Thank you for such a great interview. You're welcome! Glad you dug it. And send us some postcards. Geoff, man, perfect. I'm in. Let's smart mob the whole thing. LA or San Diego, let's pick a day in May or June, text message it around, meet up, see who's there, have lunch with Ted Kane, jump in Bryan's van, and head south. Wes. Sign me up. How about we meet on June 1st, somewhere downtown l.a. that's two people. who else? Then we walk to the border. Notebooks in hand. Sounds perfect. though i have no wheels, nor do i even drive! so right. i have a friend who's driving, but we're in a pick up. yeah, ted kane for sure. my driver is into enviro policy. i want to talk to teddy in san ysidro about migrant structures, go to the tijuana estuary study the devastation, cut inland, laredo, juarez (we need to look at the map and plan this out, i hav elittle idea right now) but try to map out the future wall expansions (maybe talk to trevor), cruise highways, go offroading, find vistas and beers, camp in the desert, talk to border patrol about the detention facilities, find out if the minutemen are incorporated, walk through border communities and eat good foods, go to tecate, sniff out tours of secret tunnels, maybe get out in to the imperial valley, out towards calipatria, pick up brochures at the prison, who knows. but May and June may be too soon. every body hold tight. stock cash. i'm just now makin' some again. wes, where were you thinkin', for how long? a short trip to Tijuana via San Diego? i like it. or? thoughts? anyone? let's figure it out. We rent the van. LAX. I'm an ace driver. See that pothole? I missed it. We stock the van with empty notebooks, pens, some cameras, lots of pillows, CDs, beer, and a toothbrush (just one), then we map the future border wall. Geographies-to-come. Politics in advance of itself. Terrains of the not-yet-divided. We get Wes framed against the desert, filming, pointing, fielding questions; we ask him things. A rabbit runs by. Cut to a small cafe where we're giving Trevor Paglen too much coffee; things are getting intense. We might declare a micronation soon, but aren't sure if that's legal. The day moves on, we're in the mountains somewhere; I'm in a bad mood because I want healthy food, and I'm constipated; we've got no phone reception; we stumble upon some Minutemen. Insanely: they're cool. We had no idea it would turn out like this. We're documenting every step, and someone's in touch with an editor at HarperCollins. We take Mike Davis out for beer and talk slums. Post-urbanism. Global militancy. Wes narrates the terrain south of San Diego, which appears to be one huge parking lot, and we give Teddy Cruz a call. Assorted political arguments break out. Wes wakes up at 1am with a vision of the most unbelievable palette house ever constructed - but it's a new moon so there's no light to write it by and he wakes up 6 hours later and it's gone. Then the toothbrush breaks. My flight leaves in 36 hours and I'm only just beginning. General Acres has been sketching the whole thing, and we're uploading it onto Archinect. Bryan, no pressure; it's your baby. I'll help, or not help. Take your time and do what you need. You've got friends to pull back-up. But maybe we'll need more toothbrushes... When the time is right, the action follows. It is so nice to read your interviews, and the interest that you have in bringing light to these issues.Congratulations in such an impresive article! I had actually run into the website of 'one small project 'a while back, and was very curious about who was behind it. So it was a great surprise to read about what Wes is doing, in such a uplifting way. I am thinking of writting to him about our shelter project, perhaps he will find it interesting. Geoff, stay tuned. This could even become a semi-regular thing, of multi-facted mobile investigations, where we rent vans and/or hotrods and meet in places, from all over the country, to hit up the investigative trail. The US border one year, the Canadian the next, test ranges in Nevada, Utah, toxic dumps and nuclear reactors in Colo., earthquake projects in Hawaii! Sort of like our own liâ€™l merry pranksters, our own liâ€™l new journalism caravan. Rotating drivers, video diaries edited in the backsets of cars or on motel tvâ€™s, books scrawled by our tread marks in the dirt. Secret counter-surveillance missions. It could become a whole literary series, with dvdâ€™s and wicked mp3 interviews on a website. Kinda like RE:search. let this one kick it off! Thanks for your nice note! I appreciate your thoughts and I am psyched you enjoy the articles. Definitely, contact Wes, he is super accessible and would love to know about your work. Cool! Keep me posted about your projects, â€˜cause I am interested, too. Bryan + Geoff (+ Kurt + Monica); Wowwwwwwwwwwwww, that idea just exploded across the sky, I was just watching and reading . . . and laughing and imagining. I don't have one thing to add. I mean, it's not that often I'm juiced out, but man, you two did it up. Kerouac, On the Road: "[T]hey danced down the streets like dingledodies, and I shambled after as I've been doing all my life after people who interest me, because the only people for me are the mad ones, the ones who are mad to live, mad to talk, mad to be saved, desirous of everything at the same time, the ones who never yawn or say a commonplace thing, but burn, burn, burn like fabulous yellow roman candles exploding like spiders across the stars and in the middle you see the blue centerlight pop and everybody goes 'Awww!'" My contribution: I'll read Palahniuk's Survivor to everybody while they sleep. We'll talk about it when you wake up. Everything you say is good to me. My summer is open, really. We can wait til later, July if you want, even early August. I've never been south of San Diego, and not there for 20 years, so I'm not much help, I mean besides reading Palahniuk. I like, a lot, opening it up to whoever wants to meet us at the LAX counter at a particular time. 3-4 days. Long weekend, something like that, if that works for the workers. It's done. All that's left is the doing. Wes. As long as we can stop by these freaky marshes on our way along the border... Though they're days and days and days away. And why Palahniuk? Not... Blake? If I can get there: I'm in. I think this trip is going to need to be paired down some, like stick to a relative vicinity and not try to race and cover too much in one swoop. gotta immerse a bit. anyway, i plan on this being the ice breaker for a series of trips down there, so think long term, and save more cash than you expect. i will start an email thread for interested parties soon enough to start working out some details. right now: G, Wes, me, my buddy Chris, Kurt (? )...any others seriosuly interested shoot me an email and let me know.